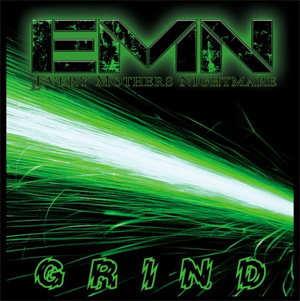 It was April 2016 and Southern hard rockers EVERY MOTHER'S NIGHTMARE were performing in Houston, Texas in support of their new, self-released 5-song EP titled Grind, which was released the summer before. During the course of the evening and my conversations with the band's manager/tour manager it was mentioned that the band was in the market for a label to help with wolrdwide distribution of said EP. In my capacity as Managing Editor for KNAC.COM I get press releases all the time and had noticed one record label in particular that had signed other bands of that era/genre. I provided the band's frontman, the Reverend Rick Ruhl, with the contact information and told him they should get in touch with the folks over at HighVolMusic. Fast forward to earlier this year when a press release went out with the news that EMN had signed with.....wait for it....HighVolMusic. Coincidence? Maybe, but I'd like to think that maybe I played a part in that in some small way. The first order of business with the band's new deal was to give Grind a proper release, but in this case it wasn't simply a matter of reissuing the EP. To the contrary, the label decided to issue it as a full-length affair, which then became the Grind album we now have set to be released on October 6th. So what we have here is actually four separate parts to review. The first part is the 5 songs that made up the original EP: "Loco Crazy" (which features Zach Myers of SHINEDOWN on guitar), "Blown Away", "Snake", "Upper Hand" and "Sacred Circle". Owning a copy of that original EP helps to compare them to the tracks on this full length and one thing stands out immediately. As good as I thought the sound production was on the EP, the songs are that much better on the full length. The production is crisp and clear and sounds great on a good stereo. Props to whoever did the mising on this release. The second part is the 3 new songs that were recorded to bring the CD closer to full length status: "Days Are Through", "Stand Up" and "Swing Again". "Days Are Through" is a nice, mellow ballad that once again showcases the voice that is the Reverend Ruhl. "Stand Up" is a great bluesy hard rocker that is made even better by the inclusion of Jim Dandy, he of BLACK OAK ARKANSAS fame, on vocals. "Swing Again" is a ferocious rocker that is sure to give the listener a nice earworm. Part three is the addition of 3 live tracks that were recorded at the band's performance in Nashville in August of last year: "Closet Down The Hall" from the Wake Up Screaming disc of 1993, the balls out "Walls Come Down" from the band's debut opus and "Push", the phenomenal lead-off track from the equally impressive comeback album of 2000, Smokin' Delta Voodoo. All three of these, for those that have never caught the band live, serve to give you a teaser taste of what you can expect from EMN in terms of a live performance. Rick Ruhl has probably never sounded better than he does now and his supporting cast of bassist Troy Fleming, guitarists John Guttery and Travis "Gunner" Butler", along with the recently announced return of oringal skinsman Jim Phipps, gives EMN dare I say its best lineup in years. Last but not least is the added bonus of 3 videos that are included: The videos released from the original Grind EP, "Loco Crazy", "Blown Away" and the live track from above, "Push". If you like your hard rock southern fried then Grind is a must-have for your collection. If you already own the original EP you'll want this one for the added materials and if you don't have either yet, what the hell are you waiting for?? Buy it now! Grab your copy of Grind in the KNAC.COM More Store right HERE. And for you vinyl lovers, there is a limited run of transparent green albums (with alternate cover art) available HERE.